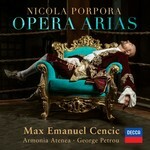 Grammy-nominated artist Max Emanuel Cencic presents Nicola Porpora: Opera Arias, to commemorate the 250th anniversary of Porpora's death. Featuring 7 world premiere recordings, this album will be released on 02 March 2018, the day before the official anniversary on 03 March 2018. This release is in addition to Cencic's new recording of Porpora's Germanico in Germanica (with Julia Lezhneva), released on 12 January 2018.